Powered by an internal rubber band, each pop up Pen Pal is supplied with its own custom mailer called a zippalope. Rubber bands do not retain their full elasticity if stored at full stretch. The rubber band in this product is at full stretch when the product is stored flat. 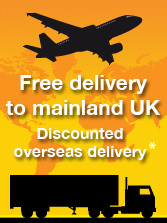 We advise that you plan to distribute the product within days of its manufacture in order to get the most effective pop-up. If this does not suit your marketing plans then call us to discuss the best way forward. The pop up pen pal or 'Power Pen Pal' is one of the best selling Popupmailer.co.uk ideas; it is powerful, it is a pen pot and it immediately becomes your customers’ desk-top pal. This is a perfect combination for a business direct mail idea and one that acts as a constant reminder of your company details. Sent out in your customised chunky mailer the Pop Up Pen Pal simply begs to be opened and jumps into action instantly with energy and attitude. The Power Pen Pal has six equal sides and even though it has a large hole to store stationery items there is a great amount of print area for your advertising message. Mailed to your customers in a matching zippalope with your custom graphics the Pop Up Pen Pal is perceived as a gift. This pop up mailer gains full customer focus on receipt and continues to work hard for you for a long time afterwards too. 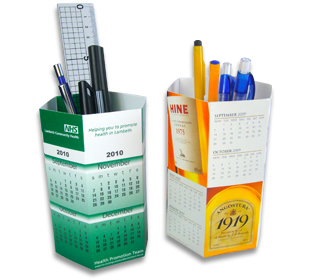 Add a printed calendar to your customised Pop Up Pen Pal and you have a two in one product that will sit on work stations for a long time. A promotional desk calendar will ensure “keepability” for a year at least, although in our experience the Power Pen Pal will be kept even after the calendar has expired. Whilst a perfect solution for a promotional idea at Christmas you can start your printed calendar at any time of year and often this gains even more focus and attention due to originality.